Normally, Thor needs no armor to take on his opponents, only his hammer Mjolnir. But when a curse by Hela made his bones as brittle as glass, and left him unable to heal from injuries, Thor constructed an enchanted suit of armor that would protect him in battle until the curse was lifted. To help create this Walt-Simonson-designed look, the Minimate gets a new helmet (with chainmail around the neck), a new cape (with built-in armor for the shoulders), a new silver bracer on the right arm, a new skirt, and new new bootfronts. The armor on the arms, legs and torso is merely painted on, keeping the figure from getting too bulky, but he paint is metallic, so we can clearly tell it's not just cloth. Thor comes with his hammer, of course, but he also has hair you can use if you want to take his helmet off (though combined with his cape, it pushes his head forward). An artificially enhanced alien, Bill was leading his people, the Korbinites, to a new planet in the wake of the destruction of their homeworld when he encountered Thor. After lifting Mjolnir and proving himself worthy of the power, he was given his own hammer, Stormbreaker. 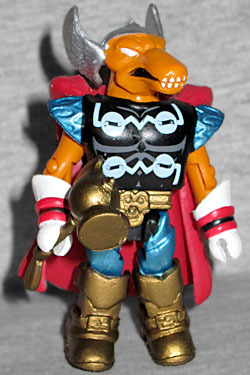 Beta Ray Bill is the same figure that was previously available in the SDCC-exclusive Stormbreaker box set, just done in less "comicbooky" colors - instead of bright blue and yellow, he's got metallic blue and gold. His hammer is a slightly darker gold, as well. His helmet is entirely silver, rather than having white ear-wings. The black shadows painted into the hollows of his mouth help the figure look more realistic, and they also did individual paint apps for his teeth, instead of a single white stripe. 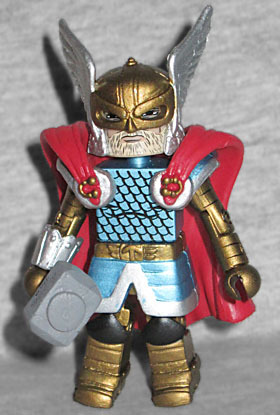 Beta Ray Bill is better than his last release, and this Thor costume has never had a toy before. That makes this set a winner!